There are various tactics used in pursuit of this strategy. Some Deal sites offer lots of deals simultaneously, exciting the “kid in a candy store” nerve. Others are teases, offering only one "unbelievable” deal on just one item per day; it may be a loss-leader, an item priced below its cost in the hope of exciting a buying frenzy on other, more profitable goods. Then there are coupon deals, made infamous by Groupon.com. Of course, there are sometimes opportunities to get items you need or want at a price that's much lower than what you'd pay elsewhere. But watch out for buyer's remorse... If you're the type of shopper who can't pass up an incredible deal on stuff you really don't need, then you'll just have to get a bigger garage, or some ninja eBay skills to get rid of your unwanted stuff. Here are some of the most popular Daily Deal sites, starting with the most infamous. Groupon was a pioneer in the Daily Deal craze, convincing small businesses to offer discount coupons guaranteed to lose money for the merchant every time one was redeemed. The idea was to “create repeat customers” but of course people who won’t buy at a profitable price are not likely to become good customers. Living Social is a Groupon mimic, offering merchants a better deal and seemingly specializing in service businesses such as hair salons, spas, restaurants, etc. 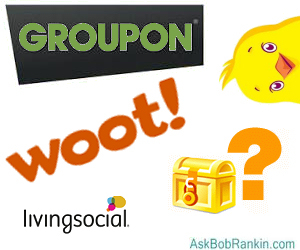 I've used quite a few Groupon and Living Social offers to take advantage of discounts at local businesses. But sadly, I can't think of any cases where I was "wowed" enough to return and make a full-price purchase. Part of the problem is that when merchants know you're using a coupon, they tend to treat you poorly. That's not the fault of the coupon websites, but it does make their business models much more difficult to sustain. Don't miss my article Twelve Online Tools for Savvy Consumers. And have you checked your credit report lately? My articles Free Credit Reports and Free Credit Scores will show you how to do it for free, and avoid some potential snares. Amazon Local started as a partnership with LivingSocial.com, including Amazon’s $175 million investment in the startup site. Today, it seems to be all Amazon – polished, efficient, with high-quality deals. If you don't necessarily want to shop locally, check out Amazon's Gold Box for daily deals and limited-time sales. SweetJack.com is owned by Cumulus Media, which also owns hundreds of radio stations. Its ad sales reps sell air time and daily deal packages to local merchants. TravelZoo has been around for years, but only recently got into non-travel related daily deals. Spas are about as far as it gets from the usual airfare, hotel, and restaurant markets served by the travel industry. Yugster is another that I've heard of, and seems to get positive reviews from users. They offer a variety of consumer items at discounted prices on a "Yours Until Gone" basis. One that I've used myself is 1SaleADay, which recently changed it's name to 1Sale.com. Ironically, they offer lots of sales every day, with a focus on electronics, housewares and jewelry. And most of the sales last longer than one day, but whatever. They offer some good deals and have a good reputation. I bought a 120GB solid-state hard drive for $50 from this outfit a while ago, and was pleased with that purchase. Woot! is a daily deal site that's been around since 2004, and is known for their wry humor on the site and in product descriptions. Every day, Woot offers one special deal called Today's Woot in a variety of categories, including Tech, Home, Tools, Sport and Accesories & Watches. Each deal starts at midnight, and is available for 24 hours only, or until they sell out. Most recent comments on "Best Daily Deal Websites"
I have used some of those daily deal websites and gotten some real good deals. You have to be very careful too. I've shopped at Yugster and had good luck so far. It pays to look at several other sites because they all seem to offer the same items and not always at the same price. Another site worth looking at is 13Deals: http://www.13deals.com/ - Items seem to be in better supply. Also, after placing an order there, they send you "secret codes" that offer discounts or freebies with the next order. I'm one of the minority that has discovered places I didn't know by using a Groupon and then going back again because I liked what I found. Had a horrible experience with a house cleaning service, complained to Groupon and got my money back. So I'm still a fan. I have gotten very good deals from Woot; be sure to check the community comments, there are usually reviews of competitive deals and other very useful info. Their t-shirt designs are sometimes interesting and the shirts are great quality for excellent price. One or two non-shirt items that disappointed were a problem, because they have had a no-returns policy, and their Customer Service tone was as snarky as some of their website copy. Now that they are owned by Amazon there seems to be an improvement and more professionalism in the CS area. Careful with Groupon - I have purchased things that would not be different with groupon version or full price with good luck. However services or items that take a reservation are a different matter. Restrictions on a B&B that were not known before the purchase but made it almost unuseful. The item said subject to availability but after you got it and tried to use it, they claimed to always be booked up on weekends well past the time frame that they were willing to take reservations for. A salon that treated people very well and then pushed the sale of discounted services for the future. They closed up before all the people I know were even able to redeem their groupons. Groupon's response tends to be "this is between you and the company involved, we only are a middleman"
I wouldn't say I got burned but I bought an expensive GPS for the car at a great discount. The catch I didn't know was that the GPS was going obsolete - hence the discount. When I upgraded maps, the entire USA no longer fit into memory and of course the memory could not be enlarged.The map died just before St. Paul, MN and wouldn't you know I had to fly to St. Paul. Just consider that you might be buying last year's model or the new one is about to be released. There also Meh.com. From the original creators of Woot (they sold Woot to Amazon). For computers, parts and general tech I love the daily Newegg "Shell-Shocker" email. http://www.newegg.com/special/shellshocker.aspx I also check Amazon as they try to match Newegg deal prices. Is there a “Search Engine” that will look for a certain item on these Daily Deal Sites? I don’t have the time to look at a half dozen sites every day. Furthermore I get enough crap in my in-box every day, I don’t want much more! Been following Woot! daily for years. Was better before Amazon bought them. Bob, I am extremely leery, of these types of websites. #1 Reason --- Tracking cookies and foistware, with their downloads. I don't need any of that. #2 Reason --- Most of these deals, are not that good, anyway. As JP says, "It pays to look at other sites, because, they all seem to offer the same items and not always, at the same price." I know where to go, to look for bargains and when I am looking for something, these are the websites, I go to. I have gotten some great deals at priceplunge.com and rakuten.com (formerly buy.com) There is pulsetv.com too. Ugh! Shopping! I was enticed onto the 'Woot!' site awhile ago. I didn't buy anything that day, but was plastered with emails and ads for all sorts of deals. I got so disgusted that I unsubscribed the same day that I subscribed. I don't know if things have become less annoying, but I simply don't need ANYTHING that badly! While I do buy items online, I prefer to patronize local merchants. They have a hard time competing, I prefer the personal attention, and they appreciate my business. I have used DailySteals.com many times with great success. On the rare occasion when I have had an issue I have received good customer service. I used to use Teambuy and Dealfind up here in The Great White North, some of their deals were not too bad, you just had to be careful which applies to any of these sites. After nCrowd Deals took them over the deals were not as good, more junk and customer service became the worst I've ever deal with. Re AA batteries. I started using Panasonic (originally Sanyo) "eneloop" rechargeable nimh batteries about two years ago. These are nimh batteries that to not have the self discharge problem of regular nimh batteries. They are expensive...I find them on sale at Costco from time to time. Probably takes at least two years to break even but for high use devices like cameras,mice and game controllers it seems worth it to me. Not worth it for devices that will run a year or more on a regular AA battery. They have an open circuit voltage of 1.2 volts vs 1.5 for an alkaline but so far I have not found this to be a problem.